Clarion Books (Houghton Mifflin Harcourt), 2019. 217 pages. This book was delightful. I shouldn’t have chosen it to read during Silent Book Club, because I kept coming to spots that made me chuckle. My friend was reading Game of Thrones, and she said it was a little incongruous. Oops! And yet some serious topics are covered in this book. There’s a little brother who died and an absent father. So that my primary response was chuckling shows that the serious topics were handled with a light touch and my overall response is delight. If it hadn’t been the first day of school, and if my mother hadn’t been crying her eyes out the night before, and if the fuel pump on the Jeep had been doing what a fuel pump on a Jeep is supposed to be doing, and if it hadn’t been raining like an Australian tropical thunderstorm – and I’ve been in one, so I know what it’s like – and if the very last quart of one percent milk hadn’t gone sour and clumped up, then probably my mother would never have let the Butler into our house. As it was, it was a crazy morning, and Carter Jones was the one who answered the door when the Butler rang their bell. There’s some confusion, but the Butler, Mr. Bowles-Fitzpatrick, takes things in hand. It turns out that Carter’s grandfather has died, and in his will, he provided a generous endowment for Mr. Bowles-Fitzpatrick to now serve his son’s family. That son is Carter’s father, who is now serving with the military in Germany. But the family can definitely use his services, though Carter’s not so sure he wants someone calling him “Young Master Jones” and requiring him to behave with good manners. And then the Butler dresses Carter up in white, along with his friend Billy, and takes him to the school football field to learn to play cricket. It seems like disaster when the eighth grade cross country team sees them – two sixth graders dressed strangely being taught to play cricket by an Englishman. But one thing leads to another, and soon the entire eighth grade cross country team is learning the fine points of playing cricket. There are tidbits about the game of cricket at the start of each chapter – and I’m still completely confused by the rules. Though I do have a much better idea of how it works than before I picked up this book. The whole idea of a proper English gentleman’s gentleman dealing with an American sixth-grade boy is what gives this book layers upon layers of humor. 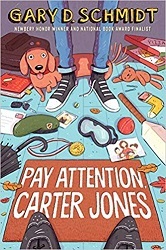 Carter Jones, though, is dealing with some big issues – and Mr. Bowles-Fitzpatrick also has compassion, in his proper English way. I finished this book with a smile on my face. Completely delightful! PS: Something else I loved about the book was that the principal was Principal Swietek! And the town is Marysville! Why is that so exciting? We find out who Doug Swietek married from Okay for Now, which was set in Marysville in the sixties. (The principal is female and her first name is given at one point.) Very fun for Gary Schmidt fans. In fact, I reread my review of Okay for Now, and yes I was right that it was the same town. Now I want to reread the book. Candlewick Press, 2018. 36 pages. 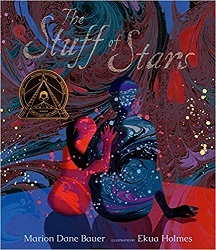 The Stuff of Stars is a gorgeous and glorious book. The book is an extra large square, so it’s got a weighty presence. All the pages use marbled papers in swirly patterns. The front cover has the title in gold-sparkled lettering like star clusters. there was yet no space. It goes on to poetically talk about the Big Bang on the third spread. And slowly how the stars and worlds formed. Christians, there’s plenty of room to explain to your child that God’s responsible for that Big Bang. Next, planets are formed, and even Earth, “one lucky planet, a fragile blue ball.” And it talks about the creatures that were formed on earth, from mitochondria to sharks, daisies, and galloping horses. Then one day . . .
YOU burst into the world. And it builds to the cozy image of two people cuddling together, the same as on the cover. The random list of earth’s creatures combined with the glorious swirling images is a perfect pairing. A marvelous and wondrous book. Katherine Tegen Books (HarperCollins), 2018. 326 pages. Review written February 4, 2018, from a book sent by the publisher. 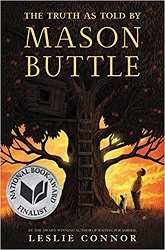 Okay, I love this book, and I love Mason Buttle! 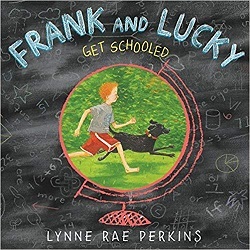 I’m writing this at the beginning of my Newbery reading year. I may read many more books I love this year, and I may be the only person on the committee who loves this book – but I am so encouraged that such a wonderful book exists. Mason Buttle is the biggest and tallest kid in seventh grade. And he has a disorder, so he sweats. A lot. And he has dyslexia, so he’s not very good at reading or writing. As you may guess, a kid like that with a last name like “Buttle,” will get teased a lot, and bullied. But Mason takes it matter-of-factly. His family’s gone through a lot lately. Mason’s grandpa died. Then his mother was killed in an accident, so only his grandma, Uncle Drum, and Mason are left. And then Mason’s best friend Benny died. Benny died after he fell from their tree fort when the top rung of the ladder broke. The sheriff keeps wanting to talk with Mason about it. But he interrupts Mason, and it’s hard for Mason to get his words out. Mason has told the sheriff everything he knows. But there’s a wonderful teacher at school named Mrs. Blinny. (Mrs. Blinny, too, is quirky and wonderfully described.) She’s got a new machine that Mason can talk into – and it will write down his words for him. Now at last, Mason can write his story. Meanwhile, Mason makes a new friend, Calvin Chumsky. Calvin gets bullied, too. But the two together start a project together and become friends. That’s only the bare bones of how the book begins. There’s a lot more going on – things with Mason’s family, things at school, the bully’s nice mother and the bully’s nice dog that Mason dog-sits, the family orchard that Uncle Drum has been selling off, and of course the mystery of what really happened when Benny died and why do so many people in town give Mason a sad-to-see-you look? But Mason isn’t the type to feel sorry for himself. I challenge anyone to read this book and not just love this kid. Here he is in the very first chapter after he misspelled stopped as STOOPID in a spelling bee and someone put a t-shirt with the word STOOPID in his locker. Matt Drinker loves when something like that happens. That’s why I’m guessing he put this STOOPID shirt inside my locker. He must have picked my lock to do it. Funny thing is I knew what the shirt said because of the two Os in the middle. I knew in two blinks. Matt doesn’t know it but he did me a big favor. I always take two shirts to school. Unless I forget. I change just before lunch. This is because of how I sweat. It is a lot. Can’t stop it. Can’t hide it. I need to be dry at the lunch table. Otherwise I’m a total gross-out of a kid. Well, today was a day that I forgot my extra shirt. So I’m wearing this one that says STOOPID on it. It’s big and it fits me. It’s clean and dry. I’m going to keep moving. Maybe nobody will see what it says. And if they do, well, tell you what. Plenty worse has happened. Neal Porter Books (Holiday House), 2018. 40 pages. 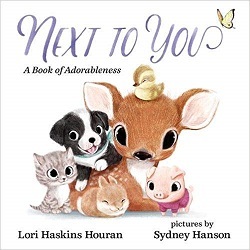 Review written July 6, 2018, from an advance F & G.
Oh, this is such a gorgeous and timely book. Mixing English and Spanish (without a glossary), Yuyi Morales tells her immigration story with glorious paintings and collages loaded with symbolism. A note at the back fills in the details. She came to America with her baby, to get married. She felt bewildered and an outsider. She didn’t understand the language. But almost the very center spread of the book is the place that changed both her and her child’s lives – the public library. We see specific books on the shelves, but also wonders pouring out of the books she opens. All the rest of the spreads are about libraries and the wonders of books. until the day we found . . .
we only needed to trust. The text alone doesn’t do this book justice. The joy of the mother and child as the world and imagination opens up is glorious to behold. 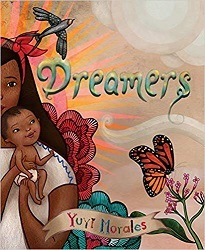 In the note, where she fills in details of her story, she explains that her child was not a Dreamer in the political way the word is used today, about undocumented immigrants brought to the United States as children. Kelly and I were Dreamers in the sense that all immigrants, regardless of our status, are Dreamers: we enter a new country carried by hopes and dreams, and carrying our own special gifts, to build a better future. Dreamers and Dreamers of the world, migrantes soñadores. Now I have told you my story. What’s yours? She includes a list of books that inspired her at the back. Oh, such a lovely book! And it doesn’t hurt that it’s a song of thanks to libraries. Candlewick Press, 2018. 355 pages. Review written June 27, 2018, based on an advance reader copy I got at ALA Annual Conference. Note: This review was written after my first reading of the book, before I had discussed it with any committee members. The views are mine alone – and I gained yet more appreciation for this book when rereading and discussing it. And today I’m completely thrilled that this is “our” Newbery winner! How we live confuses some people, so Mami starts her usual explanation. Our three flat-top houses are exact pink triplets, and they sit side by side here on Sixth Street. The one on the left, with the Sol Painting van parked out front, is ours. The one in the middle, with the flower beds, is where Abuela and Lolo live. The one on the right, with the explosion of toys in the dirt, belongs to Tía Inéz and the twins. Roli calls it the Suárez Compound, but Mami hates that name. She says it sounds like we’re the kind of people who collect canned food and wait for the end of the world any minute. She’s named it Las Casitas instead. The little houses. I just call it home. Merci’s got some of the normal middle school pressures. She’s been assigned to be Sunshine Buddy to a new student who’s a boy, and the most popular girl in the school is jealous. But on top of that, she wants to be on the soccer team, but she’s expected to babysit the twins after school. And her grandfather Lolo, who has always been her confidant, is beginning to act very strangely. And through it all, she’s hoping to earn enough money to buy a better bike than the old rickety one she rides now with Lolo. Merci’s a very likable heroine and her conflicts and friendships feel organic and not stereotyped. 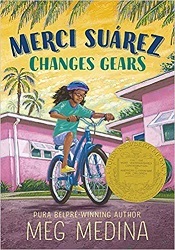 Author Meg Medina reminds us that middle school comes with lots of changes, and some of those changes – like a grandparent getting dementia – aren’t good changes. But with the help of family and friends, we believe Merci’s conclusion that she’ll be able to switch to a more difficult gear and ride on. Kids Can Press, 2016. 32 pages. Theo’s Poppa was an explorer. He kept an old trunk packed with the pictures, postcards, maps and menus that he had collected on his adventures. Whenever Theo looked inside the trunk, she found something interesting. Theo, a little girl, shows us some of the things. The art is simple drawings combined with collage for some authentic-looking souvenirs. Theo wants to be an explorer like Poppa when she grows up. But now it’s almost Poppa’s birthday, and Theo doesn’t know what to get him. When she asks him, he reminisces about how he used to go to a restaurant on the beach with Nana. That gives Theo an idea. She went to a beach on a streetcar with her class last year, and there was a restaurant there. It wasn’t long before Theo and Poppa were sketching a map. “This is where we are,” said Poppa, marking an X on the page. “And this is where the streetcar goes,” said Theo, drawing a long line from where they were to where they wanted to go. “Here’s the way from the streetcar to the beach.” She made a dotted line, like footprints. “And the restaurant is right here!” She marked another X on the map. The rest of the book is their adventure. They ride on the streetcar and play on the beach and take pictures of each other and eat at the restaurant. When they come back, Theo’s Mom and Dad and little brother have a surprise party for Poppa. And Theo puts their map into Poppa’s trunk, remembering a wonderful adventure. 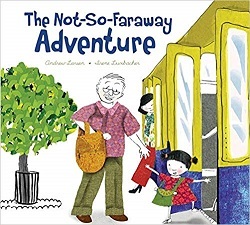 This book seems suitable for early elementary school kids, with the mapping and planning and riding the streetcar (with Poppa). However, I thought Theo looks younger than that. (But that just may be me.) There are a lot of words on each page, so I’d think twice about using this in preschool storytime. But here’s a cozy inter-generational story of the perfect gift for grandpa — complete with mapping and planning and documenting their wonderful time together. A Neal Porter Book (Roaring Brook Press), 2016. 36 pages. 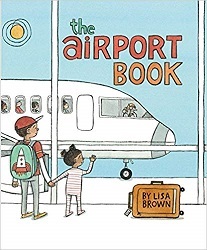 Having just taken a plane trip a couple days before I read this book, it struck me as especially useful for a family planning a flight with preschool children. Having done that many times in my life, I wish this book had been around then. And this is a modern airport. The pictures match my experience of airports well. They have big bags on wheels and smaller bags on their shoulders and backs. Sometimes you can tell exactly what is packed inside the bags. Sometimes it is a mystery. Inside the airport you stand in lines. You stand in lines to get your ticket. You stand in lines to check your bags. There are lines for the restrooms. There are lines to go through security. The text tells you all that goes on, but the real treat is in the pictures. They’re not as crowded as a Where’s Waldo book, but there’s plenty of things to see on each page, with many side stories. We watch the little sister’s monkey make its way (with the tail sticking out of the luggage). Various other passengers set out and journey as well. The featured family has an interracial couple, and there are an abundance of families on the flight itself. You’ll see more details about the other passengers with each pass through the book. Planning a flight with young ones? This book provides perfect preparation. Your child will know what to expect and what to watch for. Interested in talking with your little one about a trip they’ve taken or that you’ve taken? This book also provides a lovely jumping-off point for that. I hope this one gets displayed prominently in airport bookstores. Candlewick Press, 2016. 28 pages. This story is simple. What makes it amazing are the photographs. We meet one firefly among thousands. She finds her match by the pattern her lights flash. Here I am. She sends a silent call. As I said, it’s a simple dramatization of a firefly finding its mate through the pattern of its flashes. But who knew that pictures of fireflies could be so stunning? I especially like the way her light lights up the flower she’s sitting on. It’s simple. It’s short. But it will make you look twice. And it will help you notice the wonder of fireflies on the next summer night. Mind you, kids are already good at noticing such things. I think this book will validate their wonder. 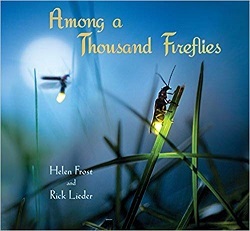 And it may start a conversation about the science of fireflies, with some simple notes (so parents will know what they’re talking about) at the back of the book.